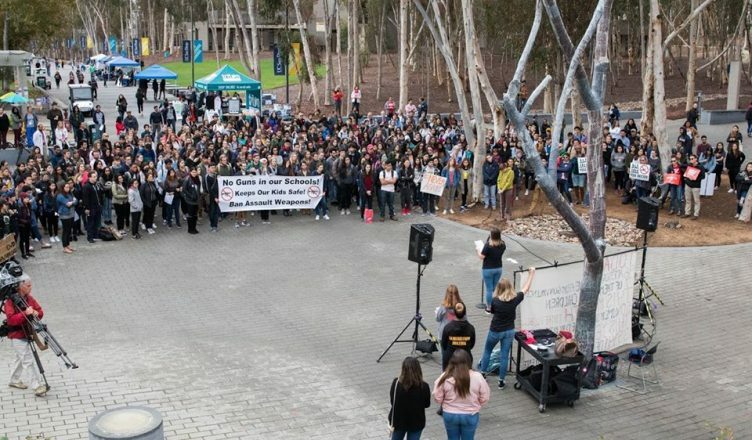 Several hundred students and faculty gathered at the Silent Tree this morning for the UCSD Walkout for Gun Violence Prevention. The demonstration was part of a larger movement at schools across the country to demand stronger gun control laws after a 19-year-old white male used an AR-15 semi-automatic rifle to commit mass murder at Marjory Stoneman Douglas High School in Parkland, Florida, on Feb. 14. Scheduled from 10 a.m. to 10:17 a.m., the event was intended to be 17 minutes in duration to represent the 17 lives lost in the shooting. Eden Allegreti, a Thurgood Marshall College freshman who organized the event along with Sixth College freshman Emma Potter, explained to the UCSD Guardian that the event was planned to inspire involvement in gun violence prevention on campus. Although the Marjory Stoneman Douglas High School shooting was the 18th instance in which a gun was fired on a school campus in 2018, Allegretti stated that she and Potter chose to take action today specifically because it would allow UCSD to participate in a larger movement. The event opened with a speech by Potter, followed by Wendy Wheatcroft from Moms Demand Action. During her remarks, Potter emphasized the statistic that 50 women per month fall victim to gun violence as a result of domestic abuse and recounted her sister’s own struggles with an abuser. Wheatcroft delivered a powerful rally cry for students to participate in with the gun control movement and fight back against pro-gun policymakers. Wheatcroft went on to condemn those in positions of power who support loose gun laws. “There are two kinds of evil,” Wheatcroft declared. “There is the visible evil. The kind that you see on the news. The kind that exists in the shooter like Parkland’s shooter. The kind of evil that is sparked by illness, pain, circumstance, or hopelessness. We’re here today to talk about a different kind of evil. A behind-the-scenes kind of evil. Not the evil that led the shooter to pull the trigger, but the evil that put a weapon of war in his hands. That kind of evil is harder to see because it hides behind fancy suits and college degrees and good arguments and slick smiles and fake patriotism. Kruti Patel, a Marshall College freshman, told the Guardian that she participated in the walkout after being inspired by her Dimensions of Culture coursework. “[In DOC], we were talking about the different injustices that happen in due to gun violence and other things,” Patel stated.